NEW YORK (CNNMoney) -- Spotify's playing a new tune. The online music service on Monday announced the addition of a free radio feature to its iPhone and iPad apps, allowing U.S. users access to an unlimited amount of ad-sponsored music on the go. Spotify's service lets listeners generate an unlimited number of radio stations based on songs, albums and artists. Users can "like" songs to save them to their Spotify playlists for later listening. London-based Spotify rolled out a streaming radio feature on its Mac OS X and Windows desktop apps about six months ago. This week's move expands the offering into the mobile realm. Right now, Spotify's streaming radio feature is only available for Apple (AAPL, Fortune 500) iOS devices. Customers who subscribe to Spotify Premium, for $9.99 a month, can listen to radio streams without ads. Those who stick with free access will get an ad-supported stream. Spotify's "launch sponsors" include a number of its existing advertisers, such as Chevrolet, Heineken, McDonald's (MCD, Fortune 500) and Verizon Wireless (VZ, Fortune 500). A Spotify representative said the radio feature is iOS-only for now but will soon be expanded to other platforms. Spotify currently offers mobile apps for Android and BlackBerry. Spotify's radio expansion puts it into direct competition with Pandora (P), an Internet radio station that went live in 2000. Pandora's mobile apps are increasingly popular with the service's 53 million active users -- although profiting off those users is a challenge. "The mobile advertising market is nascent and faces technical challenges due to fragmented platforms and lack of standard audience measurement protocols," Pandora warned in a recent regulatory filing. Spotify, which launched in Europe and came to the U.S. last year, is much smaller than Pandora but appears to be growing quickly. The privately held company currently claims around 10 million active users -- about a third of them paying subscribers -- in 15 countries. Shares of Pandora ended .26% lower on Tuesday, at $11.44. The company is struggling to reach profitability and reported a net loss last quarter of around $20 million on sales of nearly $81 million. 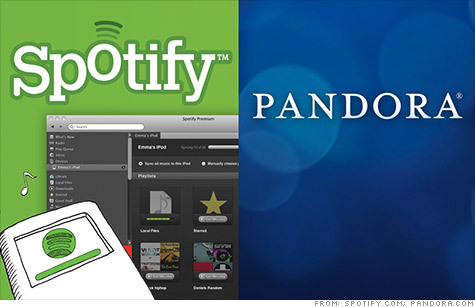 So does Spotify's move threaten Pandora? Not necessarily, said Rich Tullo, an analyst with Albert Fried & Co.
Tullo sees Spotify's new radio feature as a way to attract more users to the service's core feature: on-demand access to a catalog of around 16 million songs. "Spotify is probably doing this not to generate ad revenue -- which is Pandora's business model -- but to generate subscribers for their other services," Tullo said. "At the end of the day, Internet radio is a fast-growing business, and we don't really look at it as a business that's going to be dominated by just one player."